Lady Claire Trevelyan took matters into her own hands after her family was ruined financially. Two months have passed since then, and now she’s known as the Lady of Devices, leader of a gang of smart orphans who she’s taken under her tutelage. Claire’s passion for engineering is strong and she has decided to ignore Lord James’s threats and accept Andrew Malvern’s offer of becoming his lab assistant. Work, the children, James’s advances and her mother’s schemes, all make for a very hectic life, but the Lady of Devices knows what she wants and will stop at nothing to get it. 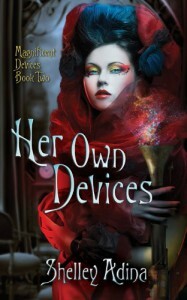 Shelley Adina’s Her Own Devices grabbed me from page one and demanded to be read in one sitting!Lady Claire has definitely stepped in and taken charge as a gang leader. This time around, Claire’s story has drive; she’s courageous and is more sure of herself and what she wants in life. She won’t let herself be cowed by Lord James, her mother, or any other insufferable person who thinks women have no place in the world. Busting out lunatics, manipulating people…now that’s the potential I knew Claire had. I couldn’t help but fume at every attempt her mother and James made to get Claire to settle down. They want her to get rid of the children! How cruel is that! ?I hated Lord James with a burning passion. He sees Claire’s extraordinary qualities and likes her for them, yet still believes women should be controlled! Whatever promises and agreements he makes with Claire, he breaks in the end. He just doesn’t deserve her. At all! Now Andrew is another story altogether. He’s kind and values Claire’s input every single time. Finally, Claire takes notice of him and realizes her mistake. Sadly, she can’t act on it because of a previous arrangement.The story still doesn’t have as many steampunk elements as I would like, but those it has are marvelous. The landau is still my favorite and the chicken coop is hilarious. The major invention is one they’re trying to build and the plot revolves around this. I loved that another woman engineer comes into play to help. 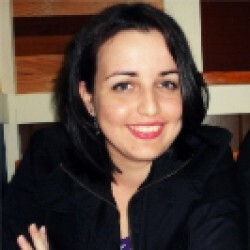 It motivates Claire’s goal of studying engineering one day.The ending was a nice surprise! Claire might have ceded power for a second there, but she takes charge again. This time around she has help as she strikes out on another adventure. Now, Andrew’s letter just melted my brain. I can’t wait for book 3, Magnificent Devices!